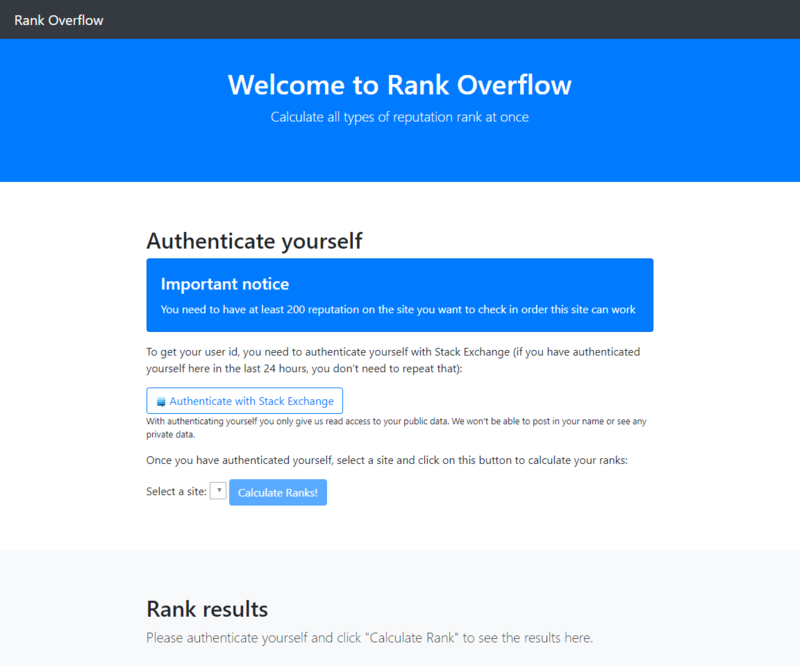 Rank Overflow is a website to calculate your Stack Overflow reputation rank in all leagues easy and with one click. I created this page because I wanted to know my percentage of my year league when the "top n%" badge is displaying the quarter. Also, if your reputation change is to low for this badge to display (e.g. top 10%, but you are top 12%), you can still find it out. We use the Stack Exchange Authentication to get a the profile IDs on the sites you happen to have an account on. You need at least 200 reputation on the site you want to check for this to work. This is a limitation by SE, not by us, as the leagues site shows only data for 200+ rep users. The website backend gets the rendered HTML from the Stack Exchange Leagues site for the community site you selected, and that for each period (week, month, quarter, year and all time) twice (first time to get your rank and the last page number, second time for the rank of the lowest ranked user). The required values get extracted and are shown as results. The required data comes from the authentication and the leagues website. If anyone has concerns about scraping to much/too often, this only happens, if the user presses the Calculate ranks button, never automatically. This website is released under the MIT License. This website was created by me and I am the only key contributor at the moment. Please submit an issue on GitHub if you run into errors. For feedback, feel free to leave a comment under this question. I am using Firefox 56, which is listed as a supported browser.